looking at three different short range models that get updated hourly, the RUC Backup (a 24hr model), the Rapid Refresh (18hrs) and the High Resolution Rapid Refresh (15hrs). All three are sowing a slug of warm air from 925 mb up to close to 850 mb. AS this thing moves through, 850mb temps look to be at -2 or -3 C at best, 925mb above freezing for most of southern MN. 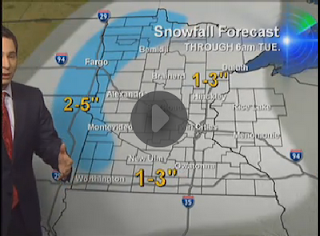 If that holds expect no more than 1" here in the metro, and that could be generous...sorry but that's what I'm seeing. 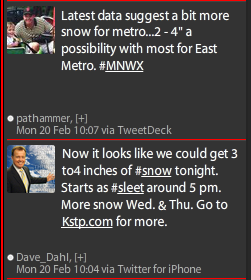 I love seeing some of those numbers going up a bit,its to be expected of KSTP they seem to always be aggressive. @Randyinchamplin it never ceases to amaze me how you can say what you say above while several others are raising their amounts,isn't all the model info readily avaiable for everyone to see,so why two different directions?.....on a side note Bill love all the snapshots of the forecasts good to see them all in one place. SamG Just using some of the new guidance that NOAA has developed is all. I applaud @Randyinchamplin for his independent thinking. Seems to me it's too easy for everyone to blindly follow models... and often that leads the majority of forecasters to be wrong (together). Not much else to say that I haven't said already. 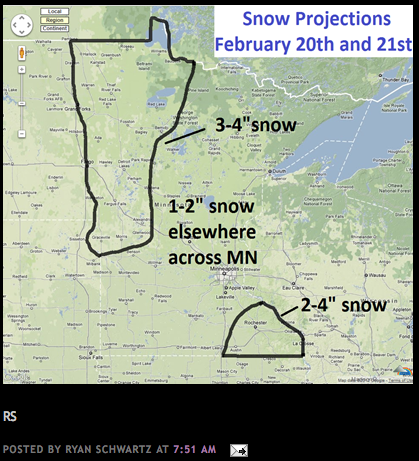 I'm sticking with my 1-3 for most of us, with 3-5 in far western and northwestern MN. Timing still looks good, with the area of moisture reaching the western metro around 6pm...starting as rain or rain/snow, then transition to all snow by 9pm. After tonight, eyes will turn to the weekend and the continued potential for a major winter storm close to home. GFS looks solid, GEM further north and west with the low and warmer, and the Euro...well there is some technical issue with that model so the 12z run is late coming in. Hopefully they get things figured out so we can see what it shows. The key today though will be timing, and how quickly things turn all snow. Models can tell us one thing, but nature has shown that she doesn't really care what a computer says or thinks. Euro is in...and it looks like a blend between the GFS and GEM for the weekend. Precip type would be an issue with the Euro, where GFS stays well cold enough throughout. Those issues would probably be confined to far southern MN and WI. The Euro is also slower bringing in the system by probably a good 24 hours. Confidence is growing for Sunday/Monday, but I still need to see more consistency with the overall track. It has been bouncing around, but still for the most part affecting the area. The only reason why I'm a bit more bullish on accumulating snow is due to the timing of the snow. If this were to fall during the day, there is NO WAY we would get over an inch or two. However, the snow is expected to fall late this evening and overnight. This should provide a better opportunity for accumulation. Regardless, I'm still amazed at all the warm air around and it certainly is making me sweat this prediction. I'm more excited for those up in the Red River Valley. 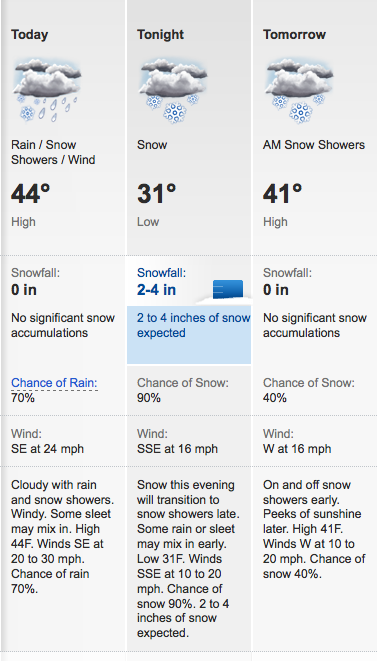 I won't be surprised if totals exceed 4 inches. Hell, I would be surprised to see some localized 6"+ amounts, especially in nw MN. Dendrite growth zone is better their and the 700mb low is more concentrated over in that area. @ Novak....I agree it is so hard right now with all the warmth around....used this tool, took out snow ratio, and just plotted max temp in profile and the Cobb method with compaction and this is what it spits out. hmm...will this play out?? 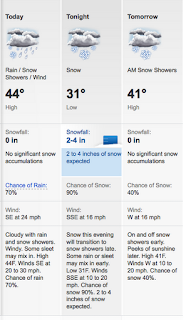 issued at 153pm today, 40% chance of at least 4"??? If so, I wonder why no Advisory has been issued..? 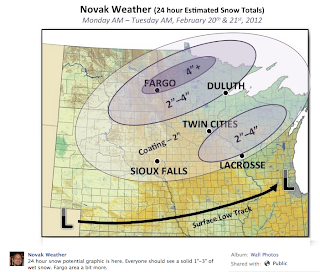 NWS is up to 2-4 inches in their graphical forecast put out a bit ago,also in their discussion they mention like Novak does it will transition to snow quicker due to the fact that precip will be falling after dark,go more snow,as Plymouth Weather Lover would say BRING IT! MPR update is for 2-3 inches with,isolated 4 inch amounts. There is already some very spotty, very lite drizzle out here in Carver County. Nothing to get worked up about and temps are still in the 40s, but it does show that the atmosphere is already saturating, which has been a major roadblock with past systems this winter. Very warm for a ton of accumulation. Randy in Champlin I tip my cap for your contrary opinion. Novak I like your participation also. Makes it fun to watch and learn. Sure seems like whatever falls will melt in the next 48 hours. The change-over to snow happened in Carver county right on cue around 6:00. It's light-moderate, and despite temps still in the mid-30s, it is sticking. WWA just issued for metro. Transition to snow already here in Golden Valley,very short period of rain,snow coming down moderately.........let it snow let it snow let it snow,I'm dreaming of a white Christmas oh wait crap Christmas is long over. Snowing pretty good in Plymouth! Love it! Was hoping for at least 4 inches so this is looking good. The lack of dry air in place is a nice change of pace. Nothing to overcome with the sw flow! Keep bringing it! Snow falling moderately to heavy in Red Wing. We got no rain what-so-ever. Oh! A winter weather advisory! I think I just crapped my drawers! ok I apologize to everyone, the short terms models over the noon hour were absolute garbage, outside of the VSREF. Next time I go against the ECMWF solution would someone please slap me up the side of the face and snap me back to reality!!! I kind of feel like Joe Bastardi when he was calling for snow as far north as New Jersey and even NYC for this last weekend, shame on me. Oh well at least I can laugh at myself. Humble would describe my felling right now. In the meantime it's a early Nov. winter land out there!!! Randy, don't be so hard on yourself. I think you nailed the forecast, at least in Rice County. Barely 1/2" here (and melting), and looks like the end is in sight on radar (unless we get wraparound). We're right around an inch+ here with probably 1-2 hours of snow left. We'll probably hit 2 inches, which would make it the biggest snow of the season for us (sad truth), but still nothing to write home about! Wheres my boy Novak,Novak if any there was a time to "inform the public" about the roads it would have been tonight,I echo what big daddy said the roads are horrible,Novak why nothing in your posts about the roads this time,I know I know we live in Minnesota and we should expect bad roads when it snows,cant blame MNDOT snow is coming down in a good clip for a while now. This much talked about Major Winter Storm for Sunday/Monday is still a good 5 days away yet I'm damn near ready to call it "A Lock". Could this be? I think tonight's storm was an odd situation. On the surface, most snowfall predictions were in the ballpark, but somehow the magnitude of the impact -- mainly the fact that the snow accumulated quickly on all roads -- seemed underestimated. Agree? Disagree? @Novak, for next weekend my thumb is on the hammer, not ready to lock and load it yet, what worries me is the EPO, we don't want to much of a nw flow before the storm gets here or the baroclinic zone may set up just to our south. It will be very close IMO. -3 Temp anomaly before the storm gets here would be nice to see, anything less, not so good. Man Duane,Randy,Novak no time for the weary,the snow hasnt even stopping and your looking towards the weekend already,please dont jinx it talking about it this far out(but I sure hope big daddy sees a big daddy,you know what I mean)so still falling in and around the metro,this is easily the longest duration snow sevent of 2012,keep it coming!!!!!!!!! Hahaha big daddy...I hear ya man. Peaking at radar it looks like there is a bit more intensification going on around the metro with some redevelopment to the south. There is a piece of energy along the trough that is helping in the redevelopment, but looking at the loop that energy is starting to fade a bit...should be interesting to see how radar reacts to that. 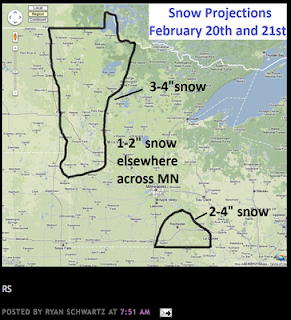 @Randyinchamplin dont beat yourself up too much,its not like you were off by 4,5,6 inches,just maybe 1 or 2,your really talented so keep it up and nail this whopper coming in this weekend,looks good on the models as of now. @Duane I love your essays man,keep it going,yeah radar returns increasing south and moving NE,snow not done yet,I could see .5 to 1 inch more during the overnight hours. Essays huh? Hahaha! Yeah I get a bit long winded. I'm just throwing this out there for good measure...I officially consider the operational runs of the Euro and GEM to be outliers, because the ensembles of these models match up well with the placement of the low on the GFS. The timing still isn't there, but general track is pretty darn close. I fully expect the Euro and GEM to come around close to what the GFS has been showing. Also, the 06z NAM is now showing the trough edging into the northwest at the end of its run. Hopefully by Wednesday or Thursday things lock in. 0z GFS looked about perfect for a big storm for southern MN. Of course I don't trust anything the GFS says. To be fair though, most of the models did at least hit the existence of last nights system a good 5+ days out. SPREAD...JUST IN CASE THE 00Z ENSEMBLE MEMBERS SHIFT NORTHWEST. what amazes me more than just the different tracks of the euro, is the timing differences. the euro is still much slower than the gfs. the gfs slams the storm through, while the euro takes its time in winding up a bigger storm. frankly if you are a fan of a big blizzard for someone, you root for the euro solution, although, meterologically speaking the gfs does make more sense (did i just say that?). the storm is still over 100 hours away and a lot can change. this is by far the most interesting storm to forecast all winter. i hope there are a few more before spring arrives. Holy Smokes! I am in 7th Heaven. Plymouth gets the most for the metro area at 5 inches?? Love it. I said bring it and it brought it. 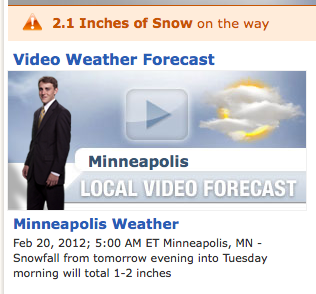 I am still hoping for 1-3 inches for mid-week (seems like people have forgotten about that little guy). Let's hope this whopper doesn't miss us as we may not have the perfect set-up until next winter. C'mon, bring it mid-week and bring it Sunday/Monday. I'm always amazed at how the temperature will drop just enough for it to dump several inches of snow, but will drop no further. We descended from 43 yesterday to almost exactly 32 when it started snowing. It's like there's a script or something. If this verifies there is a good chance most major roads in the state south of a Fargo to Duluth line will be closed. They may even have to pull the plows off the roads in the metro beyond the beltway, like in Anoka, Northern Washingto, Dakota and Carver counties etc. My oh my. The Hurricane Hunters will be flying into the system over the Central Pacific. Should help the models greatly. CWY2190...thank you for sharing that! Do you have any perspective on the scope of flights like this? Is it relatively common for the Hurricane Hunters to fly out and inspect systems during the winter? Or is this something that is considered "rare"? Ok, I was wrong on the start time. It looks like it started right around the year 2000. Otherwise that article is pretty good. Euro continues to show timing differences when compared to the GFS...track is a bit different too, but it ends up with a similar solution. I really hope tonights runs really start lining this thing up. Where's the sun and 41 degrees it was supposed to be today?? ?